Sussex Sharks have arrived in Birmingham ahead of their fourth appearance at the Vitality Blast Finals Day on Saturday. The same 14-man squad that travelled to Durham ahead of the Sharks’ quarter-final victory at the end of August has made the trip to Edgbaston, where they will train this afternoon. Sussex’s semi-final against Somerset is the second match tomorrow, with a scheduled start time of 2.30pm. The sides have met before at Finals Day, with the Sharks defeating the West Country outfit in the 2009 final to secure their maiden T20 title. The winner of tomorrow’s encounter will play either Lancashire Lightning or Worcestershire Rapids – who meet in the day’s first semi at 11am - in the final that is scheduled to begin at 6.45pm. Looking ahead to his side’s first appearance in domestic cricket’s showpiece event since 2012, Sussex Sharks head coach, Jason Gillespie said: “We’re very excited to have the opportunity to be part of Finals Day. We’ve made sure we’ve prepared as best we can and are going in with a really positive mindset. Somerset, Sussex’s semi-final opponents, finished top of the South Group before overcoming defending Blast champions, Nottinghamshire Outlaws in a high-scoring quarter-final at Taunton. New Zealand overseas batsman, Corey Anderson is the side’s leading run-scorer with 466 runs from his fifteen innings. Jamie Overton’s 24 wickets make him the second-highest wicket-taker in this year’s competition. Lancashire Lightning’s third place finish in the North Group booked them an away quarter-final against Kent Spitfires, a game they won comfortably. Leg-spinner Matt Parkinson’s three wickets played a big part on that night in Canterbury, and his 23 scalps overall make him Lancashire’s leading wicket-taker in this year’s tournament. Alex Davies is the side’s leading run-scorer with 525 from his 14 innings, a haul that makes him the second leading run-scorer involved at Finals Day… 29 behind Sussex’s own Laurie Evans. The Red Rose County will have their England players, Jos Buttler and Keaton Jennings available on Saturday. 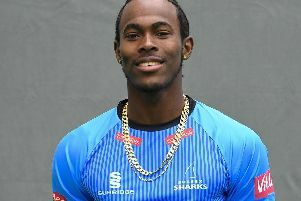 Worcestershire Rapids’ quarter-final win at home against Gloucestershire followed a first-place finish in the North Group. Medium-pacer, Pat Brown’s 27 wickets make him the overall leading wicket-taker in this year’s Blast. Australian overseas player, Callum Ferguson has hit the most runs for the midlanders: 390 in ten innings. England player, Moeen Ali will be available for Finals Day. Sussex Newspapers will giving the day full live coverage on their websites. You can also follow the Sharks’ progress on Saturday via our Match Day Centre, which will include live text commentary from the @SussexCCC twitter feed, a live scorecard, live statistics and a link to BBC Sussex’s ball-by-ball radio commentary. All three matches at Finals Day will also be screened live on Sky Sports Cricket. The @SussexCCC Facebook, Instagram and Snapchat accounts will feature all the best videos, photos and behind the scenes content direct from Edgbaston.